The seventh TimeSpace, and room, focuses on the present and recounts the female visions that are expressed in women's initiatives worldwide. These concepts are conclusions drawn from what has been experienced and remembered. They are in a tradition of female thought and action throughout all historical TimeSpaces and today, too, constitute the unrealized potential for the future of the One gender-democratic World. The circle symbolizes an all encompassing trust in a future of worldwide gender justice. Like a mirror the circle also represents self-reflection as the precondition of historical research and political action. Despite all pain and violation the life and work of Friday Kahlo nonetheless expresses her trust in the humanity of humankind. Frida Kahlo's self portrait Tree of Hope Stay Strong is from 1946. See Spirale der Zeit. Frauengeschichte sichtbar machen. Heft 7: Weibliche Visionen und Konzepte der Einen Welt. Hrsg. v. Annette Kuhn, Marianne Hochgeschurz, Monika Hinterberger und Silke Dombrowsky. Erscheint im Frühjahr 2010. [Spiral of time. Making women's history visible. 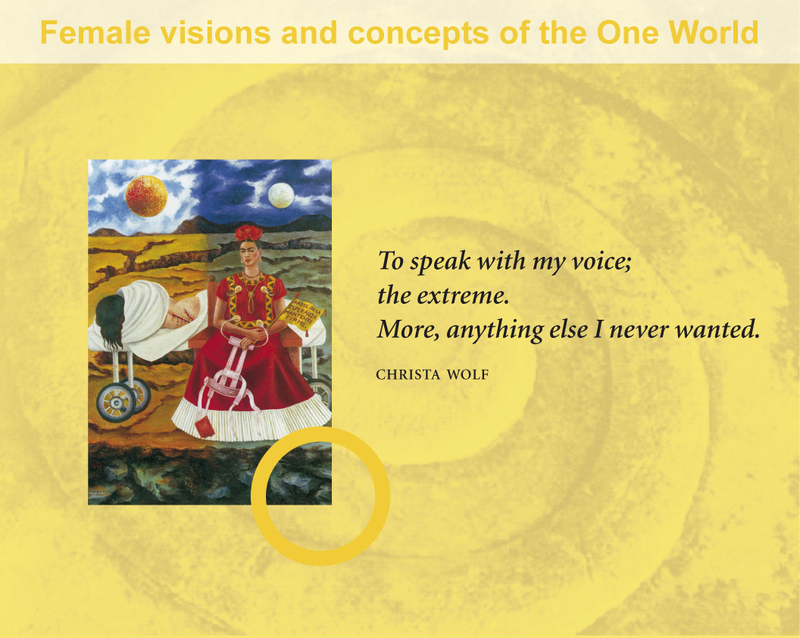 Issue 7: Female visions and concepts of the One World.] Edited by Annette Kuhn, Marianne Hochgeschurz, Monika Hinterberger and Silke Dombrowsky. Spring 2010.